This month’s great comic book cover comes from the religious Treasure Chest series (volume 1, number 5 – August 18, 1966). I haven’t read this comic, but I thinking it’s a safe bet that, since in was published in 1966, it’s not going to have a very sympathetic view toward the Native peoples who were fighting for their land and way of life. The title – The March To Glory: The Story of Custer’s Last Stand – pretty much confirms my suspicion. But, I’ll put America’s troubled and sometimes shameful past aside to look at what I think is a great cover by artist Reed Crandall. Although, what exactly happened during the Battle of the Little Bighorn, or the Battle of the Greasy Grass as it is called by Native Americans, will never be known, the image depicts Custer separating his forces as a Lakota, Northern Cheyenne, or Arapaho warrior observes. Since most of us know the results of the battle (Custer’s forces were soundly defeated), we can assume the splitting up of his men was probably not a good idea. Also, knowing the history, there’s a sense of foreboding to a lone warrior witnessing Custer’s error. Crandall does an excellent job rendering the warrior. I don’t know if the garments worn are accurate, but the drawing is wonderfully done. It’s not a comic book superhero we see, but a realistically drawn man. The anatomy is right and looks real. There’s no exaggeration, no over-muscled physique. The coloring is muted with the exception of the bright orange markings of the Native’s battle gear. Sometimes an illustration of a scene anticipating a great battle can be every bit as great as the battle scene itself. And that’s the case with this month’s great cover. Hang on. What was it you were trying to do? On this date in 1976, ‘The Shootist’ was released. 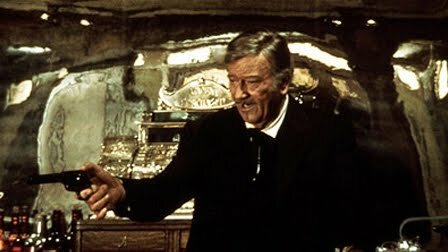 ‘The Shootist’ is a Western that stars John Wayne in his last ever performance. Wayne would die from stomach cancer in 1979. Now at this point I should warn you there will be massive spoilers ahead, so if you haven’t seen the movie and you intend to and you don’t want it ruined for you stop reading after the next sentence. But, please, do come back to read the rest after you have seen it. 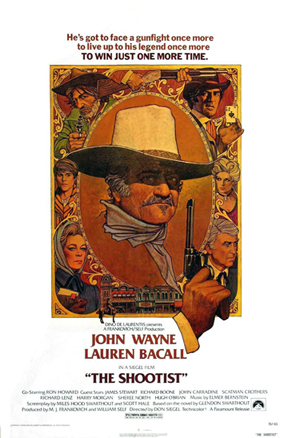 The movie is about an aging gunfighter or shootist named JB Books. Books (John Wayne) learns from a doctor he trusts (Jimmy Stewart) that he is dying from cancer. He doesn’t have long to live and when the end draws near he will be in so much pain that he’ll just stay in bed and wait to die. The doctor tells him like it is. Lays it out straight and then states, “I would not die a death like I just described, if I had your courage.” This sets up the climax of the film. Books determines the death he wants to die, although he isn’t letting on to anyone, including the audience, what kind it will be. In the meantime, Books develops a relationship with Bond Rogers, a widowed boarding house owner (Lauren Bacall) and her son Gillom (Ron Howard). Books and Mrs. Rogers have a complicated relationship. After he moves into her house, she learns he’s a gunfighter and wants him to leave; but she also learns he’s dying of cancer and, being a good Christian woman, knows she can’t throw him out. They do develop a mutual respect for each other as Books slowly deteriorates. Gillom is thrilled a real life famous gunman is living in his house. Books becomes a father figure to young Gillom, giving him life advice as well as shooting lessons. There are people who want Books out of town, namely the town marshal (Harry Morgan). There are those that want to exploit him, such as the town’s newspaper man (Rick Lenz), the undertaker (John Carradine), and an old flame from Books’ past (Sheree North). And then there are those who want to kill him. They might be seeking revenge or to make a name for themselves by killing the renown JB Books. Books goes about setting his affairs in order. He sells his horse to the livery man (Scatman Crothers) in a very confusing scene of haggling. (Or does Books sell the saddle and buy back the horse? I told you it’s confusing.) He buys a tombstone and make other arrangements with the undertaker. He decides to read every word in the newspaper he bought the day he came into town by his birthday, which was coming soon. And he has his best suit pressed and dry-cleaned. Gillom is to give the message to three men in town that Books will be at the saloon on an upcoming morning. One (Richard Boone) is a cruel, mean-spirited man, who holds a deep hatred of Books for killing his brother. Another (Bill McKinney) is a harsh little man with a big chip on his shoulder. And Hugh O’Brian plays the faro dealer at the saloon who is himself an excellent shot. It’s clear to us now that Books intends at least one of these men to kill him. Books’ birthday arrives and he heads to the saloon to meet his fate: A better death than a bed-ridden, painful one from cancer. He intends to go out guns ablazin’. A shoot-out ensues and Books kills them all. He only suffers a minor and certainly not fatal wound. He turns to walk from the saloon when the bartender comes out with a shotgun and blasts Books to death. This is witnessed by young Gillom, who charges in and takes Books’ six-shooter and kills the bartender. Before the gunfighter breathes his last, he sees Gillom realize what he had just done and throw the gun away. Books dies, pleased that the young man would not follow the path of a shootist. Did you catch what happened that has bugged me all this time? Well, here it is: JB Books decides he would rather die in a shoot-out than from cancer. So, he sets up a situation in which three skilled gunmen can gun him down. But he doesn’t let them. He kills them all. He would have survived the battle had he not been shoot in the back by the bartender, something he couldn’t have planned. What the hell was the point of setting the whole thing up in the first place? I guess having Books turn to the gunmen and allow them to shoot him down without him fighting back wouldn’t have been a satisfying ending. Especially, for a John Wayne film.